Obama’s disgraced presidency not only gave rise to ISIS in the Middle East, but also invited terrorists and their allies to visit and operate within New York City. An Iranian Mullah thanked Obama for issuing 2,500 US citizenships to officials of the Iranian Regime, prompting a legitimate question: Whose side was Obama on? 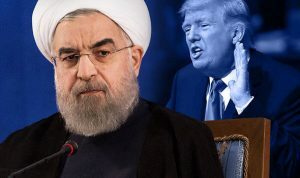 Such irresponsible decisions have paved the way for Iran to consider important U.S cities such as New York as the perfect playground for its Islamist politics. Today, both Shia and Sunni Islamist activists have united to serve the interests of theocratic governments and their governing tyrants. 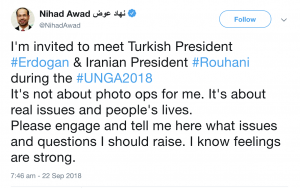 On the 22nd of September, Nihad Awad, the ‏‏‏‏‏National Executive Director of the Centre for American-Islamic Relations (CAIR) tweeted that he has been invited to meet both Presidents Erdogan and Rohani during the UNGA, the 73rd UN General Assembly in New York. CAIR is not only a foreign terrorist listed entity, but also a Hamas listed sister-organisation which has a history of relations with terrorists. CAIR is now forming relations with the enemies of the United States of America, not in the Middle East, but in New York City. At least 3,590 executions were issued under Rohani, of which 85 were women and 30 were juveniles; reaching the highest rate of executions per capita in the world. 80% of Iran’s population lives in poverty, with the remaining 20% being the members and relatives of the regime and their terrorist agencies and militias. Iran’s own media are reporting how the country’s middle class is literally disappearing and more and more people are living in poverty. 5,000 Suicides a year! Iran is home to a suicide every 2 hours and 18 minutes. 12 Million Iranians are unemployed, and almost 15 million people have no jobs. 4.5 million of the unemployed community are university graduates. Today, there are over 80,000 grave dwellers in Iran. Tens of thousands of people are living out of cardboard boxes on city streets, making this issue the fourth major dilemma in Tehran. As for Erdogan, if you thought that the Turkish President was bad before, the worst of Turkey’s dictator is yet to come. So, what exactly can such presidents with such terrible records offer America? Is CAIR really concerned about Muslims and human rights as it claims, or is this a step for CAIR to be listed as a domestic terrorist organisation as well? Perhaps it’s time.